I was so excited to get my Freddy in the mail. I tore open the box without a single thought. When I got it out and started posing it on my shelf, I couldn’t have been happier. It’s probably one of Sideshow’s top figures as far as quality goes. But I can’t resist the urge to tweak. 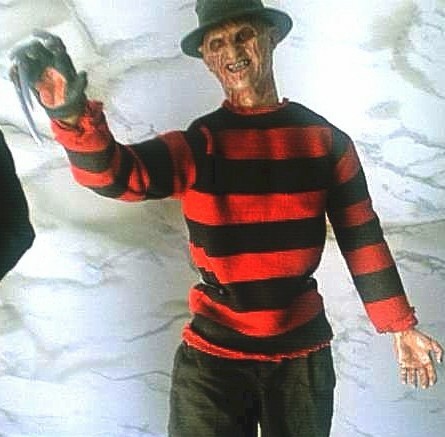 I was distracted by the fringe sewn onto the neck, wrists and waist of Freddy’s sweater. And it seemed too clean, too bright. To my dismay, I also found that his poseable fingers were too loose to hold poses. Something had to be done. First, the sweater. 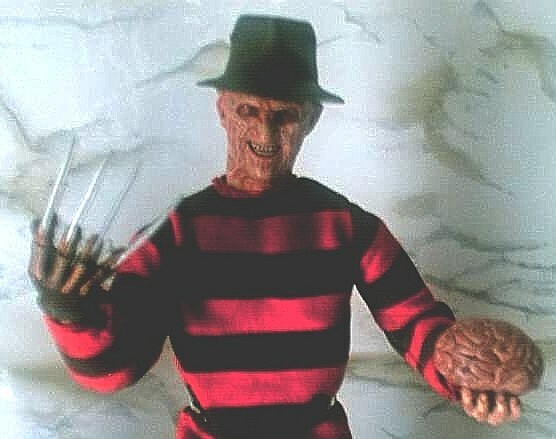 I had to boil and pop off Freddy’s head and hands in order to get it off him. About that, be gentle when it’s time to pull the head off. If the water was hot enough, and you left it in for long enough, then a gentle tug should get the head off, no problem. Pull too hard, and the whole ball joint could come off. Once the sweater was off, and my poor headless Freddy was shivering in the cold, I prepared a thin mixture of water and Liquitex brand Taupe (dull brown) acrylic paint. It was only a couple of drops of paint and about 1/3 cup of water, thoroughly mixed in a cup. Then, I turned the sweater inside out and put it under clean water to get it good and wet. Turning it inside out is important for the paint wash, so you don’t end up with splotches of paint all over the outside of the garment. After wringing the excess water out, I put the inside-out sweater in the solution and gave it a thorough soaking. Then I wrung out the sweater just enough so that it looked good and dirty. When you’re done, turn it right side out so you can see the effect and scrub out splotches, if any. If you find that your mix is too thick, it’s a simple matter of running the wet sweater under clean water until you get the level of dirtiness you prefer. Afterwards, I set it aside to dry (you can also use a hairdryer). You can also dirty up his pants using the same process. I recommend a navy/black wash for the pants. This is the length I tried to achieve on the fringe. This was also my reference picture for dirtying up the sweater. While the sweater dried, I tried to see what I could do about the loose finger joints on The Glove. The first thing I tried was to build up a layer of clear fingernail polish around the joints, but the effect didn’t last long, although a subtle layer in a few spots made the joints look kind of greasy. 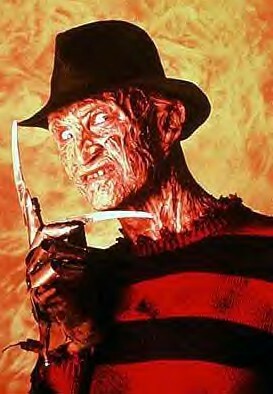 Also a light coat of it on Freddy’s exposed teeth can make them look wet for a nasty effect. I suggest using a small brush for this. However, the best solution I found for tightening the joints is also the easiest. Simply place the Glove in very hot water for a little while to soften the plastic, then immediately put it under cold running water to harden it. This should keep the joints tight for a good while. It should also straighten the blades if they came out of the box a little warped. Once the sweater was dry enough, I took some scissors and carefully cut the trim to half size. I varied the length slightly from piece to piece to get a good frayed effect going. After this, it’s a good idea to take some common white glue, dilute it slightly with water, and go over the trim using a brush. It’ll dry clear, and serves the dual purpose of keeping the material from unraveling too much and making the trim look dirty and crackly. Once it’s all dry, put it back on the body, then boil and pop the head back on. Don’t immerse The Glove in hot water, just put the bottom of it in to heat that part up enough so that it will pop back onto the wrist with ease. 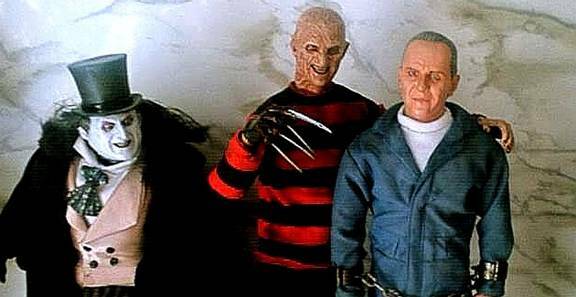 The finger joints are really small, so use caution when handling your Freddy, whether you do any of these things or not. These pics are pretty bad, but they do give you a rough idea of what the sweater should look like when it’s finished. Fred posing with a couple of custom figures.